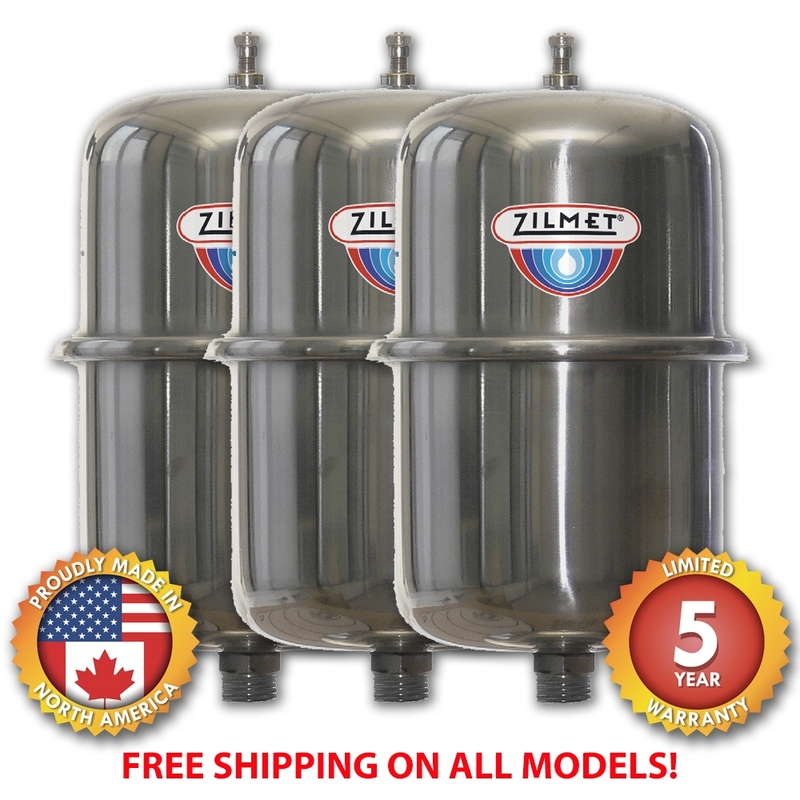 Zilmet is an international manufacturer of high quality expansion tanks, pressure vessels and plate heat exchangers, and a leader in the thermo-hydraulics field. The Inox-Pro Z8, Z12 and Z18 304 Stainless Steel expansion tanks with a food grade internal membrane, are fit for all applications near coastal areas where the presence of brackishness or harsh chemical environments that rapidly corrode all parts made of plain steel. They allow water expansion in domestic heating systems equipped with boilers or heat exchangers. They are also used in every application where ultimate hygiene is required, as in a house or a community. NSF61 Certified for use with potable water. What Size Pressure Tank Do I Need? Not interested in doing all the math below? Enter your values here to calculate. Enter your pump output, desired runtime, and pressure switch settings to find the proper size tank. Since its inception in 1964, the pre-pressurized potable water tank has assumed various designs and has proven useful in a wide variety of open-system applications. Originally used in well installations, this technology gained widespread acceptance and was soon applied in a variety of applications requiring pressurized water storage. With this flexibility, however, can come confusion as to installation scenarios and related sizing. Below, we 'll take a look at proper use and related sizing techniques in such applications as pump cycle control, volume maintenance, and water treatment systems. It is common knowledge in the water systems industry that cycling a pump motor rapidly will often lead to failure. To prevent this, most pump manufacturers normally recommend a minimum pump runtime of 2 minutes. In order to achieve the runtime, the pre-pressurized tank must store a given volume of water between pump cycles. Doing so requires the pump to run for a specific period to fill the tank. In general, larger pumps require longer intervals between start cycles. When sizing a pre-pressurized tank for the above purpose, the following information should be known: Pump horsepower, pump output in gallons per minute (GPM), and pressure switch setting in psi (cut-in & cut-out). The below procedure will guide you through a sizing scenario using a 1hp pump. The pump will be operating at 15 GPM with a pressure switch setting of 40psi cut-in and 60psi cut-out. The Acceptance Factors have already been calculated in the chart provided. The figures are based on a tank precharge (initial air charge) set 2psi below pump cut-in pressure. According to the "Recommended Minimum Runtime" notation, a 1hp pump should operate for a period of at least 2 minutes between motor starts. In order to run a 15GPM pump for 2 minutes, 30 gallons of storage is necessary. The Acceptance Factor indicates that 27% of a given tank's volume will be usable water between 40 and 60psi. Dividing 30 by an acceptance factor of .27 results in a tank with a volume of 111 gallons. ZS2 5.5" x 7.7" .53 gallons 0.7 gallons 0.5 gallons 1/2" NPTM 6 lbs. ZS8 7.8" x 10.8" 2.1 gallons 0.7 gallons 0.5 gallons 3/4" NPTM 6 lbs. ZS12 10.6" x 10.8" 3.2 gallons 1.1 gallons 0.8 gallons 3/4" NPTM 9 lbs. ZS18 10.6" x 14.2" 4.8 gallons 1.6 gallons 1.2 gallons 3/4" NPTM 11 lbs. ZS24V 10.6" x 19.1" 6.3 gallons 1.9 gallons 1.7 gallons 1" NPT 11 lbs. ZS24H 11.4" x 19.1" 6.3 gallons 1.9 gallons 1.7 gallons 1" NPT 11 lbs. ZS60V 15" x 33.9" 15.9 gallons 4.9 gallons 4.3 gallons 1" NPT 33 lbs. ZS60H 25.2" x 15" 15.9 gallons 4.9 gallons 4.3 gallons 1" NPT 31 lbs. ZS100V 17.7" x 35.8" 26.4 gallons 8.2 gallons 7.1 gallons 1" NPT 42 lbs. ZS100H 35.8" x 17.7" 26.4 gallons 8.2 gallons 7.1 gallons 1" NPT 44 lbs.